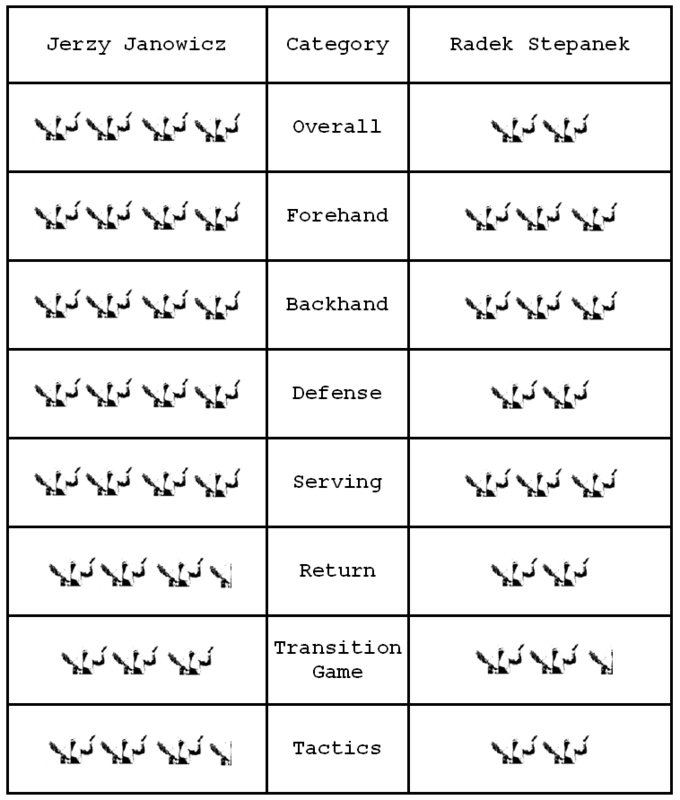 Incomplete due to Stepanek’s retirement. It was entertaining while it lasted, which wasn’t that long, sadly. However, it was worth watching just to see how natural Janowicz looked on grass, and how well his game suits the surface. 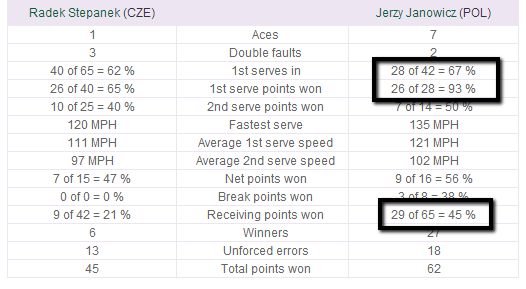 I’ll always remember this match as the one that convinced me that Jerzy Janowicz will one day win Wimbledon. A superb performance from Janowicz. He was focused right from the start, and he made very few mistakes throughout the match. I was thoroughly impressed by how naturally Janowicz’ game works on grass: his short, compact swings fit the surface perfectly. His movement was unreal, too. As I wrote above, I’m pretty sure the very tall Pole will hoist the Wimbledon trophy someday. Steps started very slowly (got broken in his first service game), and tweaked his hamstring shortly after. He gamely stuck with it and tried to make the best of it, surviving a Janowicz siege for a significant portion of the second set. However, his tactics were bizarre: he kept going after Janowicz’ forehand, when the backhand is a much better target. Also, after the injury, Stepanek was way too dropper-happy, even though Janowicz almost always found a way to read the droppers and track them down. Stepanek, ever the entertainer, managed to draw some “oohs” from the crowd when in the second set he managed to pull the known tennis trick of having a lob fall directly into one of the pockets in his shorts. He had already lost the point (his approach had been called out), so why not entertain the ticket-buyers?